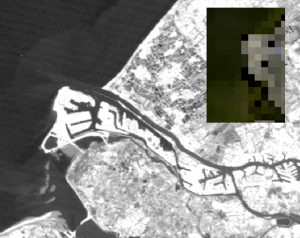 Spatial resolution is a key characteristic in remote sensing, where it’s often used to refer to the size of pixels within an acquired image. However this is a simplification as the detector in the satellite doesn’t see the square suggested by a pixel, but rather it sees an ellipse due to the angle through which the detector receives the signal – known as the instantaneous field of view. The ellipses are turned into square pixels by data processing in creating the image. The area of the port of Rotterdam shown using a Landsat image (background) at 30m resolution and MERIS full resolution image (inset image) at 300m resolution; data courtesy of the USGS and ESA. Example used within Hydrographic Academy eLearning material. Therefore, for example, when viewing an image with 1km resolution not only will you not be able to see anything that is smaller than 1km in size, but objects needs to be significantly larger than 1km for any detail to be discernable. Whilst this might be fine if you looking at changes in temperature across the Atlantic Ocean, it won’t be much use if you are interested in suspended sediment blooms at the mouth of a small river. Any image with a spatial resolution of between 50m and 1km, is described as having low spatial resolution. For example, MODIS operates low spatial resolutions ranging from 250m to 1000m as the primary focus is global mapping rather than capturing detailed imagery for local regions. If you want to look for smaller objects, you’ll need use images with medium spatial resolutions of between 4m to 50m. There is quite a lot of freely available imagery within this range. For example, NASA’s Landsat 8 operates at 15, 30m and 100m resolution and ESA’s Sentinel-1A operates at the three resolutions of 5m, 20m and 100m. If you want go even finer, you will require high spatial resolution images that go down to resolutions of between 4m and 1m, or very high spatial resolution images which cover the 0.5m – 1m range. Commercial organisations tend to operate satellites with these higher levels of resolution, and they charge for making the images available. It’s likely that military satellites offer imagery down to 0.15m, but there are regulations in place to prevent the sale of extremely high resolution imagery as it’s considered to be a potential danger to security. Spatial resolution was in the headlines last week with launch of the DigitalGlobe’s WorldView-3 satellite that can produce spectral images with a resolution down to 0.31m. Technologies to produce images at this resolution have been around for some time, but as reported by Reuters in June, DigitialGlobe has only recently received a license from the US Commerce Department to start selling images with a resolution of up to 0.25m; without this licence they wouldn’t be able to sell this higher resolution imagery. Regulatory involvement in very high resolution imagery was also demonstrated earlier this year, when in January, the UK government blocked the European Commission’s effort to set common European regulations on the sale of high-resolution satellite imagery. The UK government currently controls access to data through export licencing conditions on the satellite hardware, and they felt regulations would impact on UK’s ability to export space technology. Therefore, spatial resolution is an important term, and one every remote sensing client should understand. Different services require different spatial resolutions, and selecting the most appropriate resolution for your needs will not only ensure that you get exactly what you want, but could also save you money as you don’t want to over-specify. This entry was posted in Copernicus, Data, Earth Observation, ESA, Landsat, MODIS, NASA, Policy, Space Industry, Understanding Space and tagged definition spatial resolution, DigitalGlobe, Earth Observation, ellipse, IFOV, instanteous field of view, Landsat, MODIS, pixalytics, pixels, Sentinel-1A, space regulation, spatial resolution, WorldView-3 by Andy. Bookmark the permalink.